How many animal lovers do I have that read my blog? We are running a regular zoo here at my house. Lol! We love animals! What kind of thought do you put into your pet food? I think that a lot of people don't give it much thought….kind of like a lot of people don't think about what they are putting in their bodies as well, but that is another topic for another day. 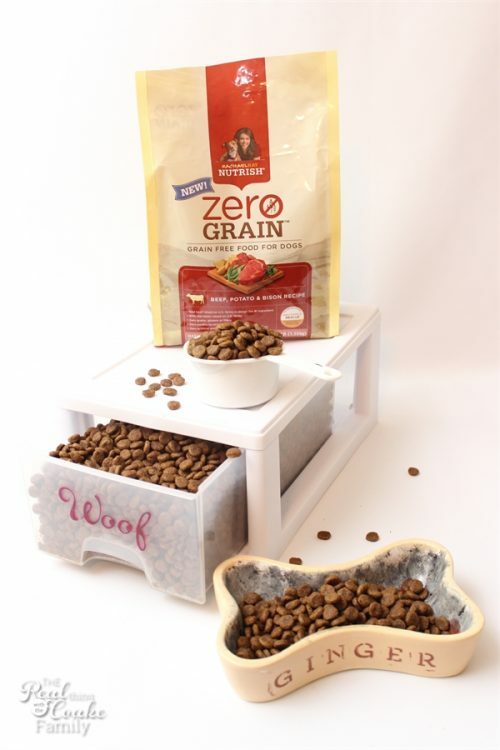 Today, I wanted to chat about pet food and our experience. For about 12 years now, I've incessantly read labels on the food we buy for us. 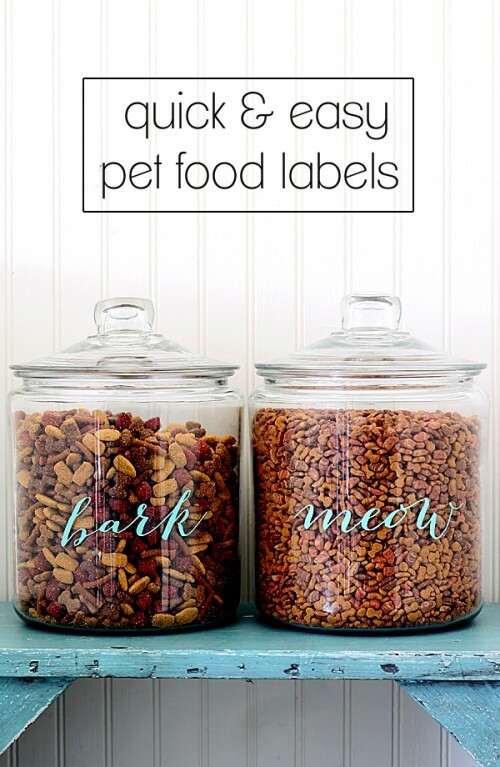 Probably about 8-10 years ago, I started reading labels on the pet food we would purchase. I have to say both can be quite scary propositions. I try to stick with labels that are ingredients I know and recognize. In 2013, we adopted our dog Ginger. She is a Beagle and she would sneeze ALL the time. The vet suggested that we put her on allergy medicine. We would give her one dose every day. She also seemed exceptionally itchy and scratchy all the time. I started investigating alternatives, because for me, whether it is a pet or a human, I like to use as little medication as possible. If we really need it, great let's use it, but so often there are other solutions. We switched Ginger to a grain free food and saw a difference. She was still a little bit itchy and sneezy, but it was better. 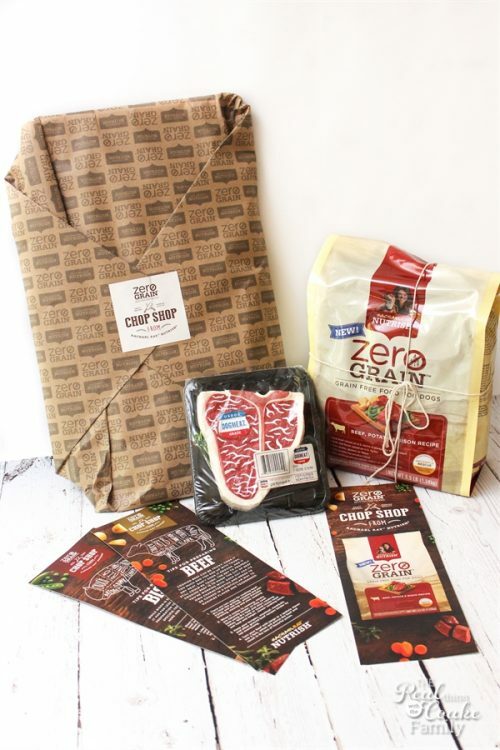 Then early on this year, I read about the possibility of doing a blog post for Rachael Ray's Nutrish Zero Grain dog food line and I was intrigued. I applied for the project but wasn't selected. I did some more research about the Nutrish line of food and the ingredients used in it and read some stories of other animals success with Nutrish. I decided to give it a go for Ginger. I found a coupon online (here is a link for you to start with your own coupon) and bought some Nutrish. I'll tell you a little bit more about how you should switch in a minute, but let's just say the results were totally dramatic. Ginger stopped being so itchy and sneezy. (I do realize that this may not be the case for every dog, nor am I suggesting that it will be the case, but for us it was dramatic.) Now that we have her only on the Nutrish food, she no longer needs her allergy medicine on a daily basis. In fact, she only seems to need it occasionally and seasonally (which for her is the fall). The vet is super pleased about this! I have been amazed at the difference. She also really enjoys the food…or course she is a Beagle, so I'm pretty sure she would enjoy any food, but it is a good thing that she really loves the food. The difference is so great that I know we have found the food for her. Just a bit ago, there was another call to work on this Rachael Ray Nutrish project and I applied again. 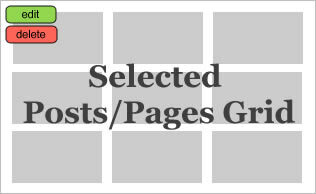 This time, I was selected…hence why you are reading this post. You guys! I almost always love my job and sometimes it is just a little more fun than others and sometimes I am totally amazed at what sweetness a company will go to when they send me things. The box the Nutrish was mailed in was so cute! I'm pretty sure Ginger knew it was for her even before I opened the door to pick up the package because we get tons of packages and she never really barks or makes noises when the delivery person comes to the door. For this package, she was whining at the door from the moment it was set down. Too funny! 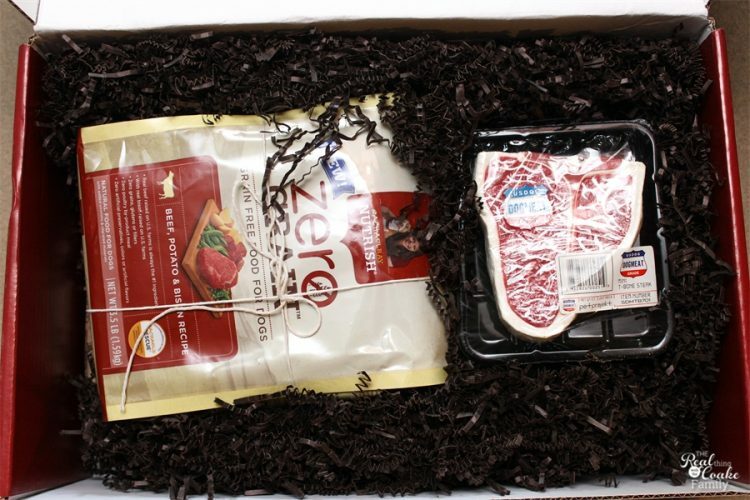 Anyway, inside the box they had sent the Nutrish food and packaged it us with the most adorable dog toy. Look at how cute that dog meat toy is! Ginger sometimes gets scared of the squeaky noises in toys, but she was very interested in this one because it was near the food. Ginger was wondering how long exactly it would take me to photograph this and open her toy. Once I did open her toy, she ripped it to shreds in a few minutes….after she ran away and hid at the squeaker noise. Lol! 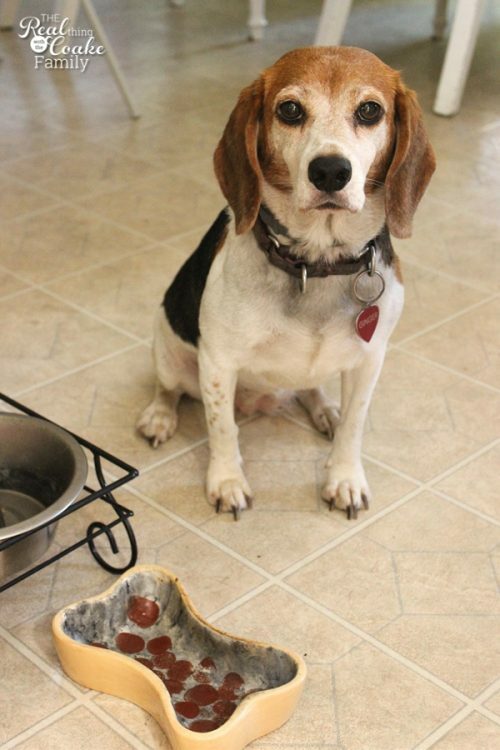 After she ripped her toy to shreds, she patiently waited by her bowl to taste this new Zero Grain Beef with Bison Nutrish. We had her eating the Zero Grain Turkey and Potato Nutrish, but they just came out with the Beef, Potato & Bison recipe. One of the things that caused me to want to switch to Nutrish when I did my research was the fact that the food, like this beef and bison, is grown in the U.S. I LOVE that! It also has zero grains, by-product meal, artificial preservatives, colors, or flavors. It is all simple, natural ingredients. Those are the things that are important to me. 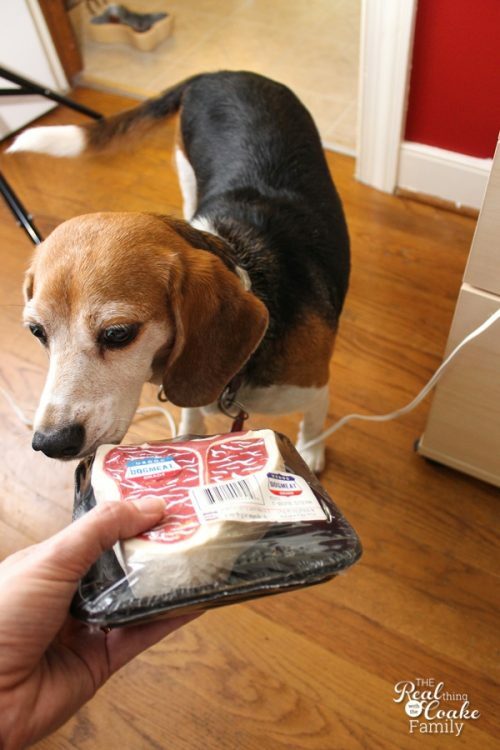 When you switch your dog's food, you will want to do it gradually. That way it doesn't upset their system. You can do this by slowly mixing in the new food over a 5 to 10 day period. It can take up to 10 days for their bodies to acclimate to the new food. We did this by mixing our old and new food together and slowly reducing the old food. 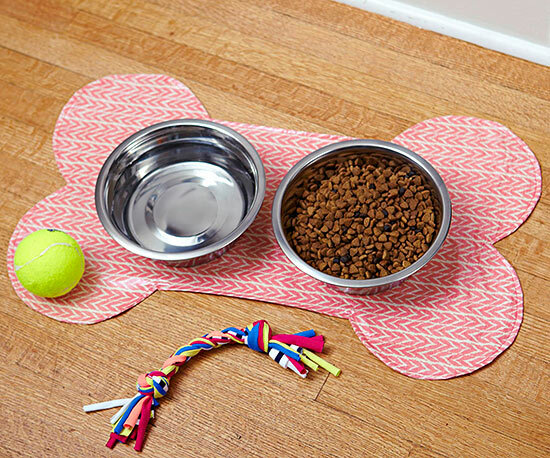 I did all of it in my pet food organizer. 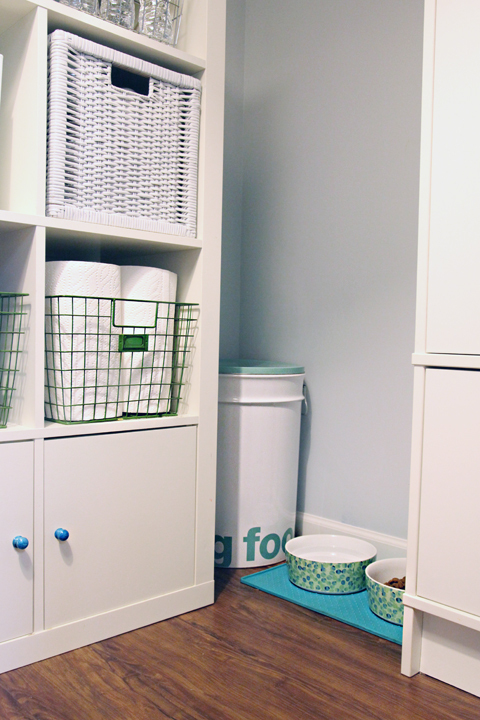 Remember when I showed you my space saving and cute solution for what to do with our cat and dog food in our small laundry room (and house with no storage). Well if you know me and have read my blog much, you know how much I love to have things organized. So once we had settled on Rachael Ray's Zero Grain Nutrish, I had to figure out how to organize it. 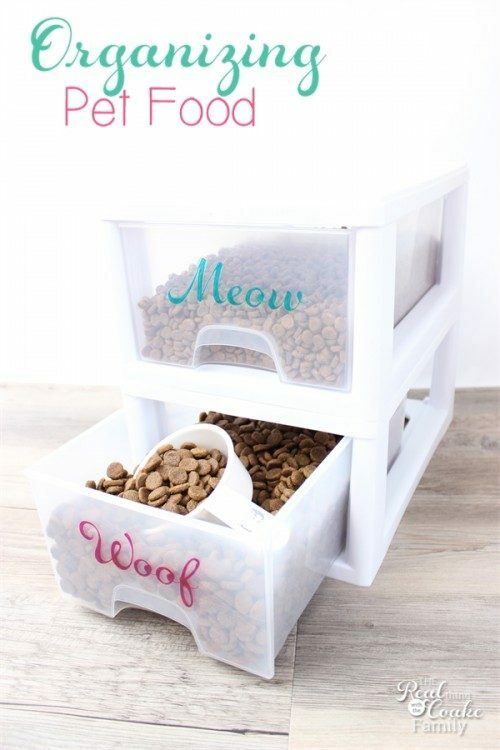 I thought you might need some ideas for organizing/storing pet food as well. To me, pet food is something that can be a pain to organize the bags and what not. If you live in an area like we do, you want to be careful or the bag of pet food will attract ants and such, but at the same time our space is limited. I've got 10 different ideas for you today, so you can pick one that works well for you and your house. Just be sure you fill it up with the good stuff for your pets…you know food with real simple, natural ingredients, and no fillers. I bet if you make the switch you will see a difference in your pet. Oh and I also included two ideas for messy pets….we may have some messy pets at our house (which drives me nuts), so there are a couple of ideas for how to help with the water and food that can go everywhere. You probably recognize this one. 😉 It works really well and actually saves me space in my laundry room. Just keep a measuring cup in the drawers to make it easy to feed the correct amounts. Could this be more stylish or cute? I love the pink as well. 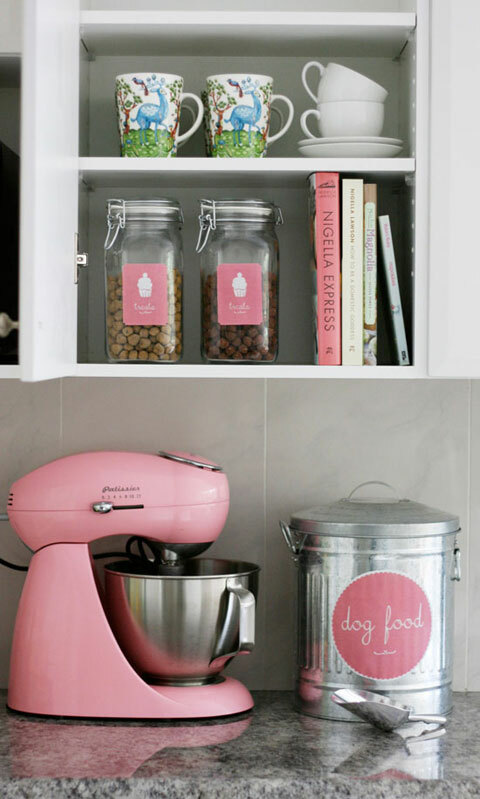 Someday, in my dream home with tons of space, I want to organize my pet food and treats this way. 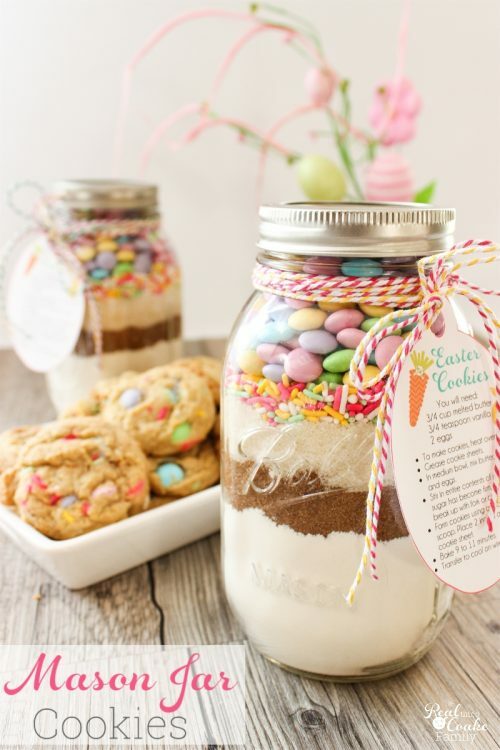 Now this is just fab! 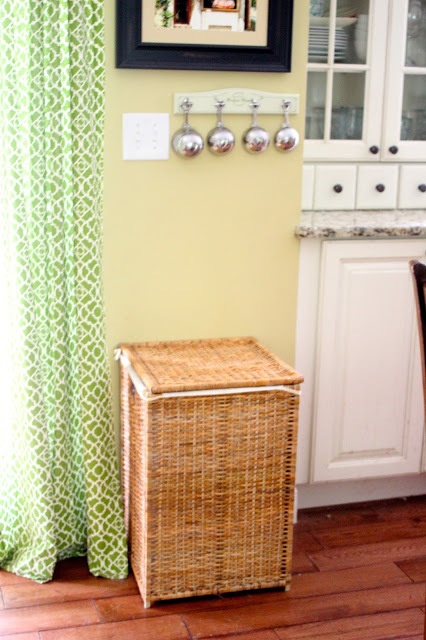 I bet you could adjust the plan sizing to a smaller size bin and, therefore, a smaller space and smaller pet as well. Love that it keeps it all in one place! 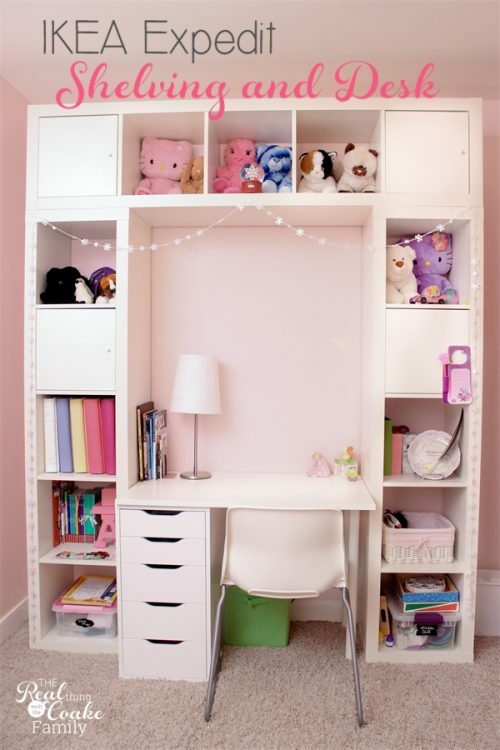 Another cute and stylish solution. I love that she has the rubber mat under the bowls to help contain the mess and that the food is right by where you need it. Perfect! Hello, cuteness! When I set out to make my pet food organizers, this is what I had in mind. Unfortunately, I don't have space. So cute! 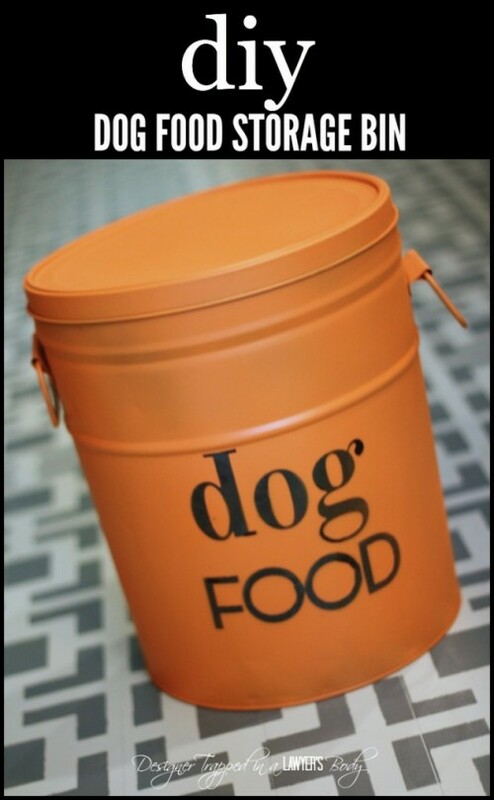 Same idea as the one above this, but this is an upcycle from a popcorn bin into a dog food storage bin. Love! 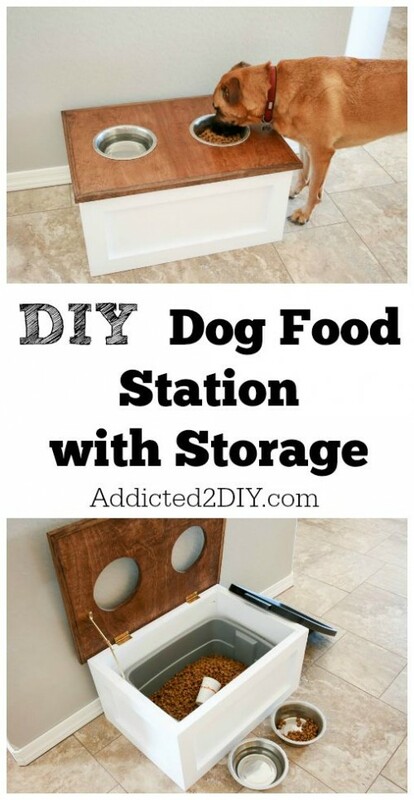 Another brilliant idea to hide the dog food right in plain sight. So smart! 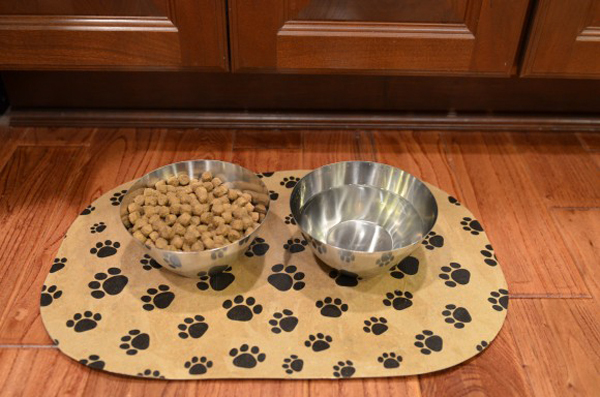 For those of us with messy pets, a pet food mat is a must. Unless you want to walk through the space (kitchen in my house) and step in a big wet puddle and really hope it is water. lol! Another mat in a dog bone shape = cuteness. Also, since this one is sewn, you could select materials that would handle the mess and wetness a little bit better and pick fabrics that go with your house as well. Perfect! So there you have it! 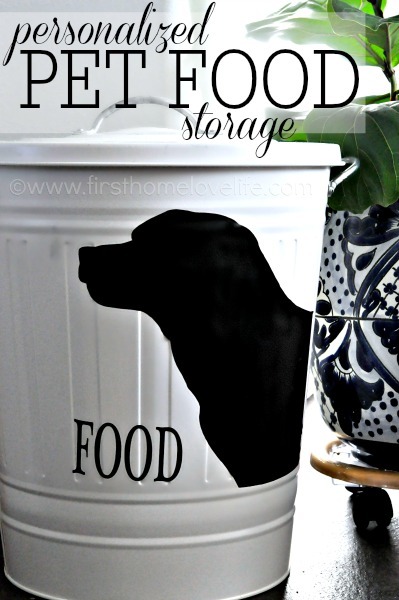 Some great ideas for organizing your pet food as well as some fantastic food for your sweet fur babies. Don't forget to follow Rachael Ray Nutrish on Twitter, Facebook, and Instagram. She is adorable! We only have a cat, but she is very particular and only wants the best food, lol!